Video captured during the Las Vegas mass shooting. The people who took it note that this seems to be an automatic weapon fired from the 4th or 5th floor of the Mandalay Bay Hotel. There’s video of this, complete with the sound of the machine gun here. A preamble. While I’ve frequently mentioned conspiracy theories here, I think I’ve been careful to draw a line on what (I think) is believable and what is not. For example, I think the Architects and Engineers for 9/11 Truth have made a credible case that the story of 9/11 has a seriously compromised narrative. One doesn’t have to believe in the Illuminati or the secret plots of the Rothschilds or the Koch brothers or George Soros to accept their understanding of the science of the collapse of the Twin Towers and WTC 7. And they’ve done an honorable job of avoiding the placing of blame. They simply state (based on their understanding of explosives and metallurgy) that 9/11 could not have occurred the way it was portrayed by the 9/11 Commission. And no, they don’t talk about ‘Holograms, man’. And I’ve rejected conspiracy theories that make no sense. I know (through two degrees of separation) people whose children were victims at Sandy Hook elementary school. I think the official narrative, while not perfect, makes much more sense than anything the Sandy Hook ‘debunkers’ have ever come up with. I’ve ended friendships over that. By the same token, I have friends who were eyewitnesses to the mayhem at Charlottesville. The sheer batshit-crazy nonsense about the car attack that killed one activist being a false flag from Hillary Clinton makes absolutely no sense. And yet, it spread far and wide. My own NY State Senator, Simcha Felder, has a senior staffer who’s been spreading that particular meme. I should point out (the linked article does) that the bromide in question is being circulated by people sympathetic to alt-right anti-Semitism. My letter to him on the matter went unanswered. And now we have Las Vegas. And to me this is just crazy–Stephen Paddock, a 64 year old man with no previously expressed political opinions (radical or otherwise), buys a huge cache of automatic weapons and long rifles, sneaks 23 of them up to the 32nd floor of a Vegas hotel, and mows down some 500+ people at an outdoor concert, killing 59 of them. The man’s own brother has no idea what this is about. 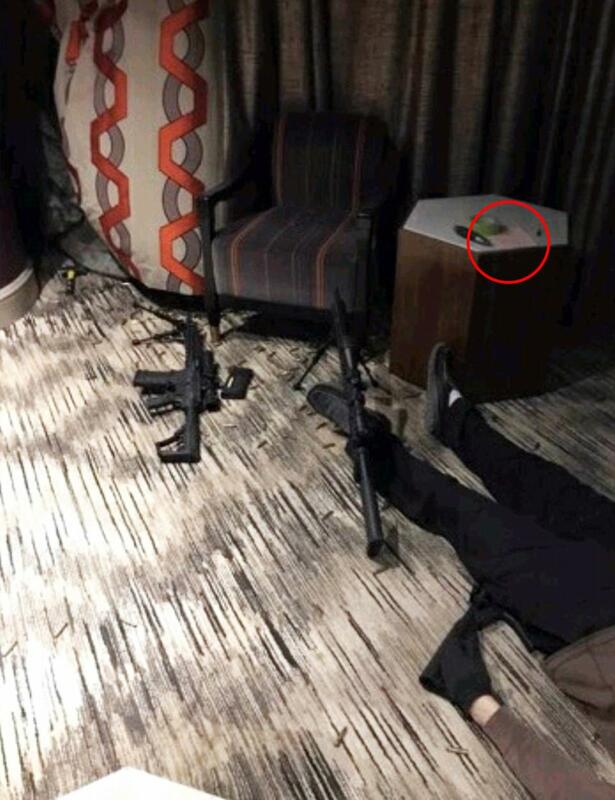 There might be evidence we haven’t seen–one picture of his Mandalay Bay suite show a piece of paper laid out as a note on a table next to Paddock’s body. But there’s as yet no narrative to explain this. And the conspiracy theorists are awake and they aren’t happy. And there’s the above picture of the front of the hotel, which you can see on video. Long story short, it sure does look like somebody was shooting an automatic weapon from a floor lower than the 32nd. It doesn’t look like it was faked. And there’s another video, from a cabbie who left her camera on as she waited for fares at Mandalay Bay. She passes the front of the building and there’s a burst of gunfire that sounds REAALLLY close. And if you look at video from the front of the hotel, there’s clearly flashing that appears to be coming from a window on a lower floor. There’s shooting sound earlier in the video, but at around 4:45, she’s driving out of the Mandalay parking area, and the sounds of a machine gun are much louder, and you can see one of the windows lighting up. So what’s a conspiracy theorist to do? The fact that the Las Vegas police have pretty much stuck to the narrative that the killings were the work of Paddock alone has muzzled much of the media in terms of addressing the discrepancies from the video I’ve posted. And someone else posted this info (not a picture, but a valid point). I’m paraphrasing a bit, but not by much. This is a 64 year old man, not looking like he’s just completed Ranger training (in short, not a stand-out military specimen). He has no military background, and nobody’s stepped forward to explain his proficiency with automatic weapons. Were those machine guns belt fed? Learning how to belt-feed a machine gun is not exactly intuitive, and non-belt fed assault rifles like M16 knockoffs were not designed to blow through 40 rounds (from a customized large capacity magazine) without jamming. Like all Vegas casinos, Mandalay Bay has hundreds of CCTV cameras, and no video has surfaced of Paddock hauling weapons up and down the elevators (even in big suitcases). And Paddock, not a physically imposing man, was able to swap out these weapons pretty quickly, one after the other, and put down what must have been hundreds of rounds of ammo. Well, historically there’s plenty we’ve found out in the years since that day in Dealey Plaza. My aforementioned friends in the Architects and Engineers movement have put out plenty of information about 9/11 in the past 16 years, none of which has made its way upstream. It took almost 40 years for anyone to acknowledge that Nixon stole the 1968 Election. Ken Burns refused to acknowledge this in his widely acclaimed documentary, but Nixon’s deal was an act of treachery that lead to an extra 21,400 American deaths and perhaps several million in Asia. So we probably won’t find out what happened in Vegas for years. And when we DO find out, nobody will be arrested and nobody will be held responsible for coverup. Some new information has come forward since I posted this. First, someone posted video on Instagram of the flashing stage lights reflected on the Facade of Mandalay Bay, and it looks like there were stage lights reflecting off it at various angles. Also, the inability of someone to fire through the glass at the lower floors is pretty convincing. AFAIK, there’s no way to have opened the fourth floor windows in question. The windows on the 32nd floor were broken out, probably by a hammer. The LV PD has not yet revealed data on what firearms they found in the room. If in fact they were all variants of the M16, I have new respect for it. My drill instructors were always warning trainees that a 3-5 round burst was about all you could expect from an M16 before the front of the rifle picked up and threw off your aim–and most of my drill instructors had been in ‘Nam, and had stories about the M16 that made us a bit… cautious about how much it could handle in terms of firing. It’s still not clear to me that Paddock could have picked up all the knowledge he needed by just asking questions at a gun shop, but maybe. We will see whether the narrative pulls together in coming days. ← HOW TO STOP THE EMPIRE at Kraine Theater!